With the holidays over and the new year upon us, it’s time for a fresh start! And one way to do it is by taking advantage of the many valuable resources available to students at Peirce College. I wanted to take a moment to share some of the events and workshops that are planned for the next few months at The Walker Center for Academic Excellence, which provides a wide variety of student support services to help you make the most of your academic experience at Peirce. 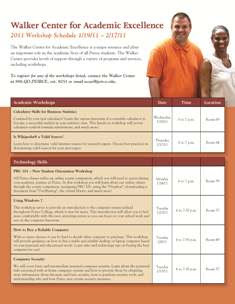 Click on the flyer below to see the 2011 Walker Center workshop schedule for January and February. It covers everything from academic support and building technology skills to personal development and online workshops. To register for any of these Walker Center workshops or find out about additional services such as tutoring, disability services, or academic counseling, e-mail The Walker Center or call them at 888.GO.PEIRCE, ext. 9251. And for first-year students, the First Year Initiative (FYI) is a great resource that offers support through a variety of programs and services that are 100 percent focused on the needs of our first-year students. FYI provides additional support to new and returning students through workshops that improve English, math, and basic computer skills. By attending, you can learn what the expectations are for entry-level classes, while also receiving workshop attendance credit for your participation. 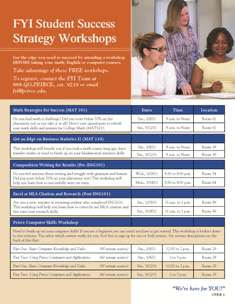 Click on the flyer below to get the full schedule of FYI Student Success Strategy Workshops. If you would like to register for any of the FYI workshops, e-mail the FYI Team or call them at 888.GO.PEIRCE, ext. 9219. And one more thing, they're all FREE!